TED Notepad is a powerful Notepad replacement which crams in a huge amount of features and functionality into its tiny, portable executable. The program can open the full range of text files, for instance (ANSI, UTF-8, Unicode, Unicode Big Endian). It has direct support for a host of specific encodings, and understands Windows, Mac, Linux or mixed newlines. So wherever a text file has come from, you should be able to import it properly. Editing features then extend the Notepad basics in all kinds of ways. So there's true multi-level undo and redo, for instance. 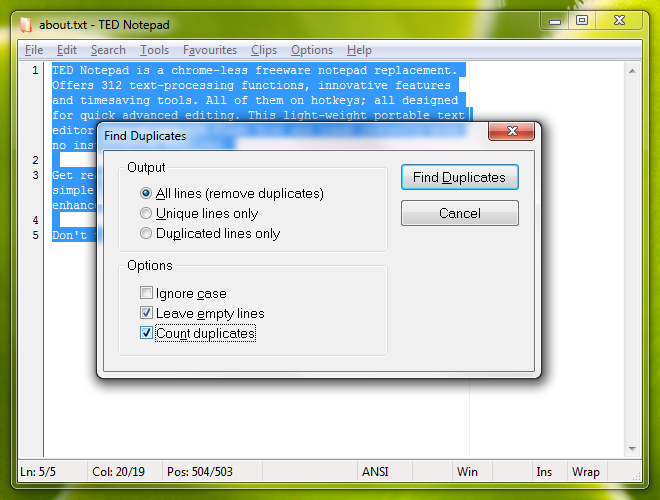 You get 9 mini-clipboards, allowing the program to hold all the common words and phrases you need, then paste them into documents with a couple of clicks. There's easier mouse selections (double-click to select a word; triple-click to select a line, another click selects the paragraph, another the entire document), and that's just the start. There are also a host of text processing features. Select a few lines and you can adjust their case, indent or unindent them, sort them into order, remove empty lines, count duplicate links, reverse them in various ways, unwrap lines or paragraphs, and a whole lot more. Ted Notepad also makes it easy to insert files names, dates and times (in various formats) into your documents. Powerful search and replace options help you to correct any problems. Lots of useful keyboard shortcuts make it quick and easy to access the features you need. And if you don't like the way any of this works then there are plenty of options and settings to help change that. Most remarkable, though, is that you get all of this in a portable program which takes up a mere 256KB of drive space and is entirely free. Go grab a copy immediately. + Added: Drag&Drop editing; moving text by mouse is available via both buttons. TED Notepad is an excellent text editor, easy to use when you just want to make a quick note, but with a host of powerful features on hand should you ever need them - and as efficiently coded as anything we've ever seen.